The front page of the Chicago Tribune's sports section provides a bit of foreshadowing with the two eventual pennant-winning teams in its headline. Where have you gone, Luke Appling? As the 1950 season came to a close, the Chicago White Sox finished 38 games behind the pennant-winning New York Yankees. Appling, who was a 43-year-old former star shortstop for the White Sox, only saw action in 50 games that season. He played for the final time on Sunday, October 1 in a doubleheader against the St. Louis Browns at Comiskey Park. He was 2-for-7 at the plate during that twin bill. The final hit of "Old Aches and Pains'" career came during his final at-bat in the eighth inning. Many White Sox fans assumed Appling, who was the franchise's cornerstone throughout the 1930s and 1940s, was the logical choice to succeed Red Corriden. Team ownership fired Jack Onslow early during the 1950 campaign and handed the managerial responsibilities to Corriden. In fact, according to Baseball Reference, Appling still has the highest all-time wins above replacement (74.4 WAR) in franchise history. Perhaps Ted Lyons' subpar 3-year tenure (185-245-4, .430) as the Sox skipper deterred management from elevating former superstars to lead the team. In 1951, Appling would find himself at the helm of the Southern Association's Memphis Chickasaws. Management tapped former catcher Paul Richards as Corriden's successor. But change in the top spot remained constant. Marty Marion would succeed Richards during the 1954 season, and then Al Lopez would take the reigns in 1957. The New York Yankees had a stranglehold on the American League during the 1950s. Of the 10 World Series during that decade, the Yankees played in eight while claiming the crown in six. The Brooklyn Dodgers and Milwaukee Braves, the only two teams to defeat the Bronx Bombers during that run, did so in 1955 and 1957 respectively. Only two other teams won the American League pennant during the 1950s. In 1954, the Cleveland Indians (managed by Al Lopez) reached the World Series but lost to the New York Giants. After eight consecutive winning seasons, the Chicago White Sox finally dethroned the Yankees and won the franchise's first pennant since 1919. The Detroit Tigers take the field in what will end up being a more than four-hour-long game. Opening Day always conjures images of lush green grass, bright blue skies and radiant sunshine. But in 1959, the White Sox began their regular season campaign on the road in Detroit's icebox better known as Briggs Stadium. 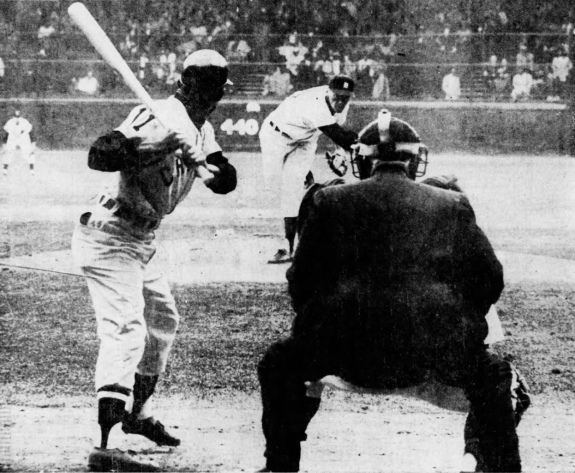 On a windy, 37-degree Friday afternoon, the Detroit Tigers sent Jim Bunning, a future Hall-of-Fame pitcher and future United States senator, to the mound against Chicago's Billy Pierce. Bunning, who led the American League with 20 wins and 267 1/3 innings pitched in 1957, only managed 14 wins in 1958. He also saw his ERA rise from 2.69 to 3.52. Pierce, who began his career as an 18-year-old Tiger in 1945, matched Bunning's win total in 1957. While his win total dropped to 17 in 1958, unlike his Opening Day counterpart, his ERA dropped from 3.26 to 2.68. Following Detroit's pomp and circumstance, Bunning quickly dispensed of the White Sox in the top of the first inning. Luis Aparicio, Chicago's leadoff hitter and shortstop, grounded out to his counterpart Rocky Bridges. Second baseman, Nellie Fox, doubled to right field, but was eliminated when Jim Landis hit an inning-ending, 4-6 double play. White Sox shortstop, Luis Aparicio, waits for Jim Bunning's first pitch of the 1959 season. Detroit grabbed an early 1-0 lead in the bottom of the opening frame. Despite retiring the first two batters, Eddie Yost and Harvey Kuenn, Pierce surrendered a solo home run to future Hall-of-Famer, Al Kaline. Both Bunning and Pierce hung zeroes on the scoreboard until the top of the fourth inning. First baseman Norm Cash sparked the offense with a single to right field. Right fielder Al Smith reached first on a bunt single that advanced Cash to second. Johnny Callison, Chicago's left fielder, walked to load the bases. After Bubba Phillips struck out, Pierce stepped to the plate and hit a grounder to second base. Callison was out at second, but Cash crossed the plate and evened the score. Aparicio followed with a grounder that retired Pierce to end the inning. After Pierce pitched a 1-2-3 inning in the bottom of the fourth, Nellie Fox leadoff the top of the fifth with a single to right. Landis stepped to the plate and cracked a 2-run blast off of Bunning to give the White Sox a 3-1 lead. Then, Bunning hit the wall. He retired Sherm Lollar, but Cash singled. With Smith at the plate, Bunning threw a wild pitch that allowed Cash to reach second. With Smith still at bat, Tigers manager Bill Norman, sent Bunning to the showers and signaled for Tom Morgan. Smith walked, but Callison and Phillips hit fly balls to left and shortstop respectively. Detroit thundered back in the bottom of the frame. Pierce retired Red Wilson, surrendered a single to Morgan, and then allowed Yost to double. With two runners in scoring position, Kuenn's single drove home both runners. Kaline followed with a double that advanced Kuenn to third. Again, with two runners in scoring position, Gail Harris grounded out to first forcing Kuenn home. Frank Bolling popped up to center to end the inning, but Detroit reclaimed a 4-3 lead. Between innings, Sox manager Al Lopez pulled the plug on Pierce's Opening Day start. With only one out, the Sox attempted to rally by getting Jim Rivera and Aparicio into scoring position, but Landis popped up to right and Lollar grounded out to third. In the top of the seventh, the White Sox, with two outs reclaimed the lead. Callison walked, Phillips singled and pinch hitter Earl Torgeson walked to load the bases. Lopez called upon Billy Goodman to pinch-hit for Aparicio. Goodman reached base on a Larry Doby error. The error allowed Callison, Phillips and Torgeson to score. Sammy Esposito replaced Goodman on the base paths and promptly scored when Fox singled to left field. The rally ended when Landis hit a fly ball to right field. In the middle of the seventh, Chicago held a 7-4 lead over Detroit. The score remained the same until the bottom of the eighth inning. Sox pitcher, Ray Moore, allowed two consecutive 2-out walks to Doby and Bridges. Norman sent Charlie Maxwell to hit in place of Wilson. He promptly answered the call by clubbing a 3-run home run to deep right field evening the score. The score remained tied through regulation and forced extra innings. Fast forward to the top of the 14th inning. Tigers pitcher, Don Mossi, retired Phillips and Torgeson with fly balls to center and right. Esposito followed with a single to left field. Nellie Fox, who was 4-for-6 on the day, belted a 2-run homer to deep right field giving the White Sox a 9-7 edge. Landis followed with a grounder to third. 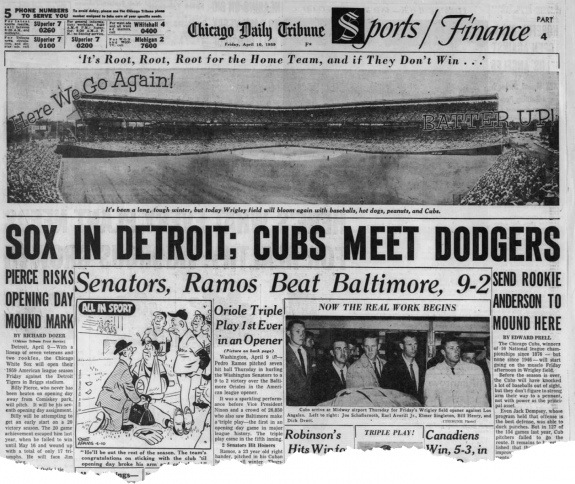 The following morning, the Chicago Tribune celebrated Nellie Fox and his game-winning heroics. Lopez summoned Gerry Staley to shut down the Tigers' offense. Kaline grounded out to short and then Harris walked. Bolling made the second out with a grounder to second, but advanced 90 feet to second. Lopez sent Staley packing and called upon Don Rudolph. Norman countered by calling upon Neil Chrisley to hit for Johnny Groth. The White Sox claimed the Opening Day victory when Chrisley popped up to center field. 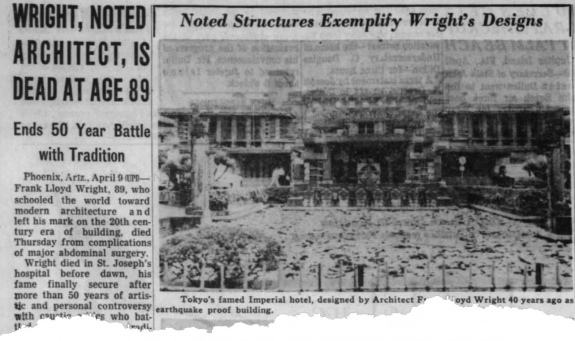 Legendary architect, Frank Lloyd Wright, passed away.